How Much are Our Textbooks used in the Classroom? Posted by Mafalda Marques on July 31, 2018 in e-textbooks, open access, Uptake. Posted by Mafalda Marques on July 26, 2018 in Dissemination, distributions and discovery, e-textbooks, open access. Posted by Mafalda Marques on July 18, 2018 in Dissemination, distributions and discovery, e-textbooks, open access. Posted by Mafalda Marques on July 10, 2018 in Dissemination, distributions and discovery, e-textbooks, open access. 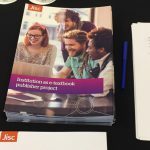 Posted by Mafalda Marques on June 15, 2018 in Benchmarking, Costs, Dissemination, distributions and discovery, e-textbooks, Evaluation, Feedback, Implications of implementation, Licensing, open access, Technology, Uptake. Posted by grahamstone on June 14, 2018 in e-textbooks, News, open access. Posted by Mafalda Marques on June 7, 2018 in e-textbooks, open access. Posted by Mafalda Marques on June 5, 2018 in Dissemination, distributions and discovery, e-textbooks, open access. Posted by Mafalda Marques on May 17, 2018 in e-textbooks, Implications of implementation, open access.